Home National News & Views California and the U.S. The trials of Rep. Maxine Waters: Ethics or payback? Congresswoman Maxine Waters waged a more successful war on drugs than the entire U.S. government. Maxine was concerned with those who made enormous profits from this trade, such as Ronald Reagan. He used those profits to fight a war for which the Congress would not pay. He flooded urban America with that poison. South Central Los Angeles was one of its targeted destinations. South Central is the heart of Maxine’s district. “Former President George Bush, while serving as vice president in the Ronald Reagan administration in 1981-89, presided over a Nicaraguan Contra cabal that was responsible for flooding the streets of Los Angeles’ South Central district with crack cocaine and fueling a murderous cycle of gang violence,” wrote Jeffrey Steinberg in the Sept. 13, 1996, issue of Executive Intelligence Review. This is the most important conclusion to be drawn from “Dark Alliance,” a series of articles by Gary Webb published in the San Jose Mercury News on Aug. 18-20, 1996, and later as a book. Maxine Waters was concerned about this high-level drug business. She invited Gary Webb to Washington to testify. I arranged for his airline ticket. Gary was ignored by the committee investigating the issue, a committee headed by Porter Goss. “Mercury reporter Gary Webb provided a detailed account of how the Nicaraguan Democratic Forces (FDN, the Contras) financed their 1980s war against the Sandinista regime in Managua, through a cocaine pipeline that went from Colombia, to the San Francisco Bay Area, to the streets of Los Angeles, placing crack cocaine and guns into the hands of the Crips and the Bloods,” Steinberg continues. For this piece of work, Gary was fired from the paper. 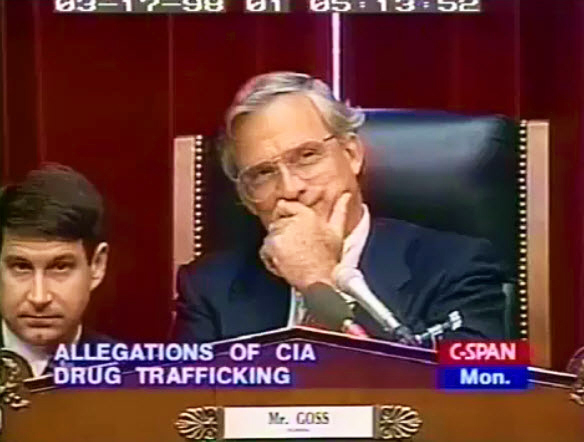 All the time that this crack epidemic was being unleashed by the Contras, Vice President Bush was the man in charge of the Reagan administration’s Central America drug trading program, overseeing all of the activities of the CIA, the Pentagon and every other government intelligence agency. “Some of Bush’s most immediate subordinates,” Steinberg reported, “including his National Security Adviser Donald Gregg, National Security Council staffer Lt. Col. Oliver North, and ‘ex’-CIA officer Felix Rodriguez, were major players in the day-to-day cocaine-Contra operations. “As the result of wide public exposure of the San Jose Mercury charges, U.S. Sen. Barbara Boxer (D-Calif.) and Rep. Maxine Waters (D-Calif.) called for a full federal investigation of the Contra-crack connections. Sen. Boxer, on Aug. 28, wrote to CIA head John Deutch, asking him to investigate the Mercury allegations, which emphasized the role of the CIA in directing the FDN. On Sept. 4, Deutch wrote Boxer that he had ordered the Agency’s Inspector General to conduct an internal review of the allegations and report back to him within 60 days.” No such report was ever seen. In 2004, Gary Webb was found dead from two gunshot wounds to the head, which the coroner’s office called a suicide. Prior to the Mercury series, there was massive evidence that the Reagan-Bush-North Contra apparatus was involved in flooding the United States with cocaine, through Mena, Arkansas, and other locations. Repeated efforts by Maxine Waters and honest agents of the Drug Enforcement Administration and other law enforcement agencies to investigate were systematically suppressed by Porter Goss for “national security” reasons. Maxine appeared before the Goss committee many times in her effort to unmask the drug kingpins that were in the U.S. government and the major banks of the United States. Porter Goss, now a non-member of the United States Congress, is co-chair of the ethics committee investigating Maxine Waters. If Mr. Goss is as successful in investigating her as he was in covering up the drug misdeeds of two presidents, Maxine is in deep doo-doo. Maxine is the go to person for Black and Brown people who seek economic justice. The National Bankers Association went to her for access. She arranged the access. She had no authority in the decisions made by the government. She had no control over the claims made by the bankers. She had made disclosures about her interest on several public occasions in the required venues. Joseph Debro is president of Bay Area Black Builders, co-founder of the National Association of Minority Contractors, a general engineering contractor and a bio-chemical engineer. He can be reached at transbay@netzero.com. Congresswoman Maxine Waters was the guest for a 39-minute interview Aug. 18, 2010, on KPFA’s Letters to Washington, hosted by Mitch Jeserich. They discussed the allegations of ethics rules violations she currently faces and the ethics investigation process. On March 16, 1998, the House Intelligence Committee heard testimony concerning a report on CIA involvement in drug trafficking. 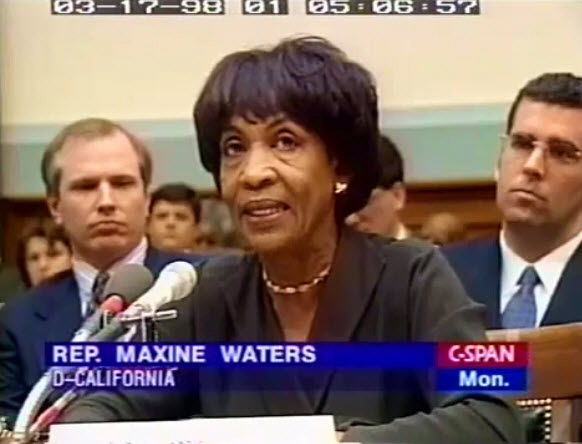 The testimony of Congresswoman Maxine Waters is recorded in these four videos. Excellent article. The plot thickens!! Chief. Please elaborate. The article is quite extensive. It is 2017 and Maxine Water's is totally gone! What a mental case. The day after Trump's election she strived for impeachment. Democrats have no agenda! They cannot accept the loss. This is a complicated issue. It's disturbing that Webb was shot twice in the head and they wrote it off as a suicide. I would not be surprised if the CIA "allowed" things to happen, as the Dark Alliance series suggested. At the same time, it's worth mentioning that guys like Frank Lucas are thought of as heroes by some for doing the exact same thing. The difference, I guess, is that Lucas never pretended to work in this Nation's best interests. I've never been one to say a drug is "an epidemic." That phrase takes all responsibility from the drug user, who is ultimately to blame for his/her problems. But just because the drug user, the gangster and the thug can be blamed, you can't give the CIA a pass. It's also interesting to note that while the New York Times and the LA times initially thrashed Webb's series, they later retracted their criticisms. It's all very subtle and not nearly as overt as something like the Bay of Pigs. Whether all this has something to do with the troubles of Ms. Waters, who knows? This is why I believe in a strict curfew of 9 pm for all males 18 and under, and a curfew of 12 for all adults. how about a curfew for bent white political scum bags over 18 from 12am to 12pm! Sales of newly built homes dropped to their lowest level since the government started tracking the numbers more than four decades ago, with demand for home purchases down in all four regions of the country. Thank you Maxine Waters, Chris Dodd, Barney Frank, Gregory Meeks and a host of others. Either you are completely incompetent or you had ulterior motives for your words and actions. Some of the most ridiculous "reporting" I've ever read. Thank you, search engines, for bringing me to such a thing to remind me it exists out here in the extremist, conspiracy-fan edge-of-the-world. It couldn't be that Waters screwed up due to a lack of morals…it MUST be the result of a massive decades-long conspiracy that MUST be tied back to Reagan and Bush! C'mon…take off the tinfoil. An "extensive" article doesn't mean it's accurate and reflective of reality. Thanks Mr. Debro for your article. It is quite possible that investigating of Mrs. Waters is payback for her dogged pursuit of the truth in the wake of the Dark Alliance articles first published by Gary Webb in the San Jose Mercury News. It is no secret that the US is the biggest drug trafficker in the world (it is one of the reasons we are in Afghanistan). The government agency most involved in the trafficking is the CIA if you want to validate that claim go here and read for yourself http://www.serendipity.li/cia.html or here http://www.globalresearch.ca/index.php?context=va… If you read the Dark Alliance story (I have read it more than once) it is very clear that the crack that showed up on the streets of LA through Freeway Rick was coming from Danilo Blandón. Here is a timeline of events from that time here http://www.streetgangs.com/magazine/ciadrugconnec… . If you haven’t read the Dark Alliance articles here they are http://www.narconews.com/darkalliance/drugs/start… take a walk down memory lane. The emperor does not like to be forced to face up to the fact that he has no clothes on. That is what Mrs. Waters did with her relentless push to find out the truth. She pushed so hard that the then director of the CIA John Deutch had to show up at a town hall meeting in LA as seen in the first video clip. They hammered him and for the first time in a public forum a CIA director got his hat handed to him. It was also the first time that I know of that the black community (much less everyone else) could really connect the dots to WHO was RESPONSIBLE for the drugs showing up in our neighborhoods. It is just a shame that we have not taken that truth from that event and pushed it throughout our community so that we are not playing the whole fool at the end of the CIA/criminal justice/prison industrial complex food chain. We owe Mrs. Waters all the support that we can give her. She stuck her neck out to expose the truth and what is happening now in terms of this investigation is probably nothing more that a get back at you move by the beltway boys. She exposed them for what they really are drug dealers and killers (if you think Gary Webb committed suicide I got news for you). It is probably no coincident that Peter Goss is heading the investigation committee. How does someone who is not even a member of congress now get to head a committee that is investigating congressional misdeeds??? He has an ax to grind and this is a golden opportunity for payback for him. Mrs. Waters has been singled out and targeted now we as a community have to stick our neck out and help defend her. It is the least we can do. Great great,great article it's good to hear the truth thanks Bay guardian and Maxine dtay blessed bless America let freedom ring. If as you say this is so, why now are we bring up the "drug" connection, why not all along. It's because we are viewing the facts from our own perspectrives – wherever that is. we would have some foks heading off to the big house. Guest, Have you noticed how you can out a CIA agent and nothing happens or make up fiction for a war where over 70 thousand die and no one is blamed. Your leaders watched computer created images to go to war.Wake up,we have satellite that would show this plus we were searching the ground with surveillance planes.Weapons of mass destruction, yes we had plenty. Maxine is a great rep! Strange that Porter Goss blocked this investigation,and is co-chairing the present one you think?